The day started off well (sleeping in) and ended well (thank-you notes with the lady) and had some awesomeness in between (errands and lunch with a friend), so, basically, a perfect day. I slept in until 9:00! I was also up for an hour and a half in the middle of the night, but…9:00! Before lunch, I decided that was the perfect time to switch out the cable boxes and, as a result, was a tiny bit late. But lunch was with my friend Angela, who I haven’t seen since right after I started dating Chris three years ago. We probably live 20 minutes apart, so there really is no excuse. And you know those friends you have where you pick up right where you left off and talk for almost two hours? Yeah, she’s one of those friends. And she took time away from her adorable daughter, which she seldom does. I felt very special. Tonight, we finished up thank-you cards for the party. Of course, I was tearing up. What else is new? I think my staycation may be a little boring, but it’s kind of awesome. Tomorrow — more errands! I do love a good errand. And dinner for a friend’s birthday. Not from Pittsburgh? 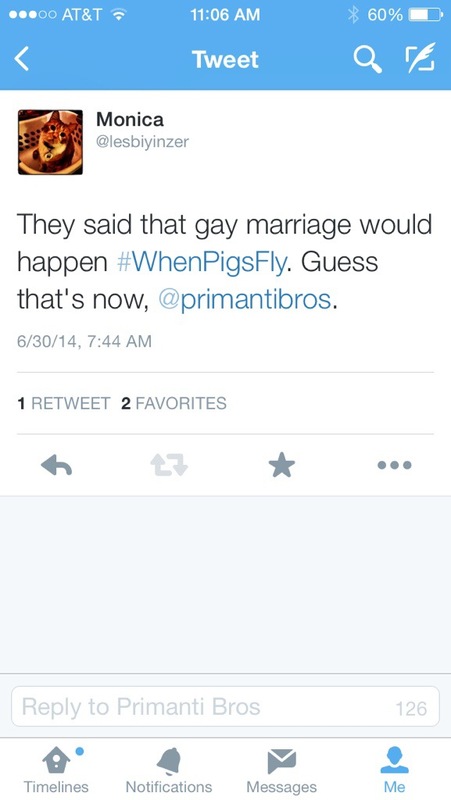 Don’t know what Primanti’s is? It’s a giant sandwich with coleslaw and fries on it. And they also have delicious, delicious wings. I’m going there tomorrow, so there may or may not be a picture. You are kind of a big deal!! !